ULM: When did you first begin your writing career? ULM: What inspired you to the Hesse Creek Series? AT: I’m inspired by lots of things, but I think my two biggest inspirations are travel and music. If I’ve visited a place that I feel connected to, you can bet it will end up in one of my stories. Case in point: I spent five weeks in Southern California last summer, and loved a particular seaside community there so much, I decided to write that one of my characters had grown up there. Music is a huge motivator for me too. It happens often that a lyric will hit me just the right way, sometimes while I’m driving, and I’m sent scrambling for my pen and paper to jot down the birth of a new plot line. ULM: How has your career in broadcast journalism helped you with creative writing? AT: I was a broadcast journalist for years, covering both sports and news, and it was a very interesting profession. I wrote most of my own scripts in the newsroom and out in the field, and the tight deadlines pushed me to become a stronger writer very early on in my career. That said, I absolutely prefer fiction writing. It’s much more fun to tell these kinds of stories, with the goal of making people feel good at the end of it all. I’m not a fan of cliffhangers or depressing endings, because I spent so much time covering that stuff as a member of the media. I’m a big fan of a “happily-ever-after.” There aren’t enough of them in the real world. ULM: Describe the feeling when you became an award-winning author. AT: I couldn’t believe it when I heard that my first novel Walland had won the National Indie Excellence Award for Romance. It was surreal, but also a real validation of my work that was completely unexpected but not unwelcome. My second book Seeds of Intention went on to win multiple awards, including a Ben Franklin Award and another NIEA award for Chick Lit. 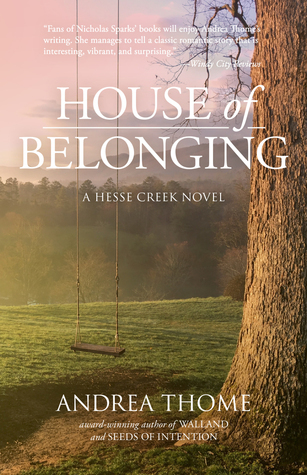 I’ve got my fingers and toes crossed for House of Belonging. The third and final book in the Hesse Creek Series is a book that I’m so proud of. ULM: How did you chose the Rocky Mountains as the backdrop to your last novel, House of Belonging? AT: I personally feel most alive when I’m in the woods, hiking near a river or stream. I really didn’t have any idea that my second book Seeds of Intention would take me to the Rockies when I started writing it, but as it often happens, the characters and their story made that decision for me. House of Belonging picks up a year after Seeds ends, and it afforded me the luxury of really spending some literary time exploring Aspen, which is one of my favorite towns on earth. I simply go where the stories and characters lead me. ULM: What was it like creating both Logan Matthews and Laina Ming? AT: In Laina Ming, I tried to create the kind of friend with personality traits that I value the most; Laina is strong, independent and funny. She was a dream to write. Logan was a character that carried over from Seeds of Intention. I didn’t see him coming, and when he showed up near the end of Seeds, I knew his story had to be mined a little more deeply, and I immediately knew there would be some intense chemistry between he and Laina. ULM: Using only three words, how would you describe your style of story telling. ULM: How did it feel when you finished writing the last novel, House of Belonging, for the Hesse Creek Series? AT: Finishing that last chapter of House of Belonging was very emotional for me. I was thrilled with how it all came together in the end, but sad to say goodbye to these characters who had grown to feel like members of my own family. That said, I’m ready to move on to create something new. I hope my readers will stay on board. ULM: Where can readers find both you and your work online? Readers can find me all over social media, (links below,) and I also have a personal website with lots more information. ULM: What other works are you planning to complete, if any? ULM: What is your advice to aspiring writers? AT: Be prepared to invest time and a lot of effort. It might take you a few books to get some traction, unless you’re a leprechaun or you’re in the right place at the right time. Keep doing it because you love to write. Soak up every moment of the joy that it brings you. Because the writing is the easy part. There is so much more to building a career as an author. You should make it your business to learn how to be social media savvy, and be prepared to post interesting and thoughtful things across all platforms daily. Twitter, Facebook, Goodreads, Instagram, Pinterest. And don’t forget about managing a website! Authors should also find an excellent literary publicist to help guide the way, if budgets allow. I’ve been so lucky to have the best people helping to show me the way. It doesn’t hurt to invest in some fun book-related swag to send out to the incredibly generous bloggers and media that go out of their way to help spread the word about you and your work. Book-loving people are generous. They want to help you. Make sure to thank them at every opportunity. And be sure to hit the gym. You’ll be carrying boxes of books in and out of events, particularly if you’re an indie author. My arms have never looked better.